Learning Tree is proud to offer the following Management & Leadership Specialist & Expert Certifications, so you can validate your skills. 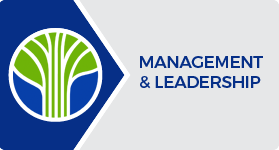 As a Certified Specialist in Management Leadership, you have the in-depth knowledge and skills to apply core management skills, tools and techniques to deliver results. You employ best practices and embody the behaviors of effective managers - leadership, delegation, motivation, empowerment, communication and vision. As a Certified Specialist in IT Management Leadership, you have the skills and experience needed to apply a proven management model for leading technical staff to excellence. You lead with vision, motivate and empower with passion, facilitate effective communication and delegate with clarity to individuals and teams. As a Certified Expert in Management Leadership, you have demonstrated an ability to apply the best practices of effective managers as well as the expertise and confidence to motivate others to achieve greater individual and organizational success. As a Certified Expert in IT Management Leadership, you have demonstrated the ability to apply a proven management model for leading technical staff to excellence. You have the expertise to apply the best practices of Business Relationship Management (BRM) to build a strong alignment between IT and the business, and leverage Emotional Intelligence (EI) to improve your effectiveness as a leader. The Learning Tree Certification is a personal help to me within my company. Certification is a great addition to my personal development plan and helps to position me for future responsibilities.